Asda reported a 4.7% dip in like for like sales for the second quarter, a figure CEO Andy Clark described as disappointing as he said the brand had reached its "nadir". 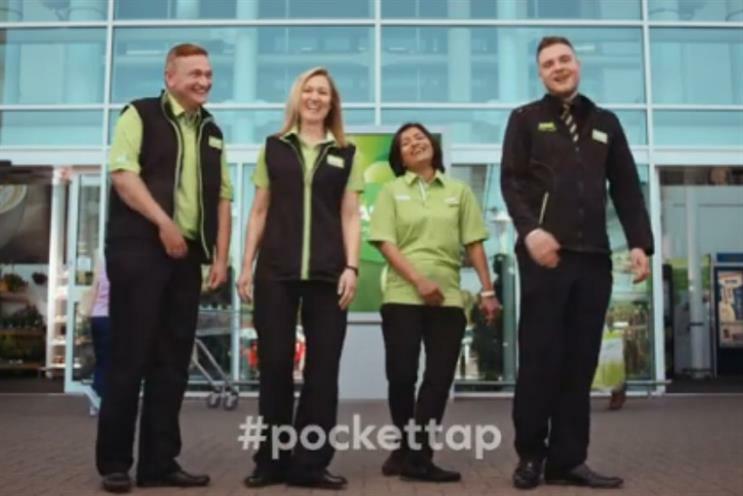 Will the resurrected pocket tap campaign help Asda in the third quarter? Talking at the press conference in London today, Clarke said that although the sales were disappointing - worse than its first quarter - it had seen green shoots of recovery emerging in the first part of the third quarter. He admitted Asda had reached its nadir, or lowest point, but asserted the business was on track to improve performance over the rest of the year and that its brand refresh had resonated well with customers. In February Asda announced it would incporporate parent Walmart's 'sunshine' logo into its own to tighten the connection between the two businesses. In July it rolled out a brand campaign featuring the famous pocket tap, the refreshed logo and a new strap-line from Walmart: Save Money. Live Better. The spot by VCCP aims to showcase Asda's "customer focus" and communicate the range on offer in stores as the retailer hopes to claw back sales from competitors, including price driven Aldi and Lidl. Asda's chief customer officer Barry Williams, who took the reins in January from former marketing head Steve Smith, told Marketing that whilst it was early days, the campaign had had a positive impact on sales, alongside improvements in price and customer service. He said: "We are starting to see some initial positive signs but it is very hard to pinpoint that to one thing," adding that the business was starting to see the benefit of the brand campaign as well as investment in service, quality and price. "The brand positioning in the new campaign is much more of a long term play." he added. "Customers are fed up of retailers talking to other retailers and arguing about who's got the cheapest price of Finish dishwasher tablets this week. They're not interested. "What we're doing is reminding customers about the truths of our business. And the truths of our business are: that we are the value leader in large stores, reminding them of the value of large stores and happy colleagues and what better way to remind them of that then to bring back the pocket tap." He admitted that Asda was not doing a good enough job of communicating these values before. "I don't think we were," he said. "And everybody has now converged on our game of communicating price. What we don't want to do is confuse customers any further. They know what we're all about and what we stand for, we just need to remind them of that." He added that while the Walmart references didn't resonate greatly with UK consumers, it beneffited the brand to be allied with the US retail giant. Asda wants a higher private label penetration. Should brands be worried? In order to comptete with discounters Aldi and Lidl, who are steaming ahead gaining market share, Andy Clarke said he would like to see Asda offer more private label goods. Aldi and Lidl both have high own label and low brand penetration. Barry Williams said Asda would look to increase its own label range, though he said he did not "subscribe" to the thinking that the discounters had made consumers more accepting of unbranded goods. He told Marketing: "If I was a brand owner, I wouldn't be so much concerned about the growth of private brand in the discounters, I'd be much more concerned about the positioning of my brand and whether it's really good for customers. "Because if all that happens is a race to the bottom on price and we starve the market catrgories of any innovation and development, the person who generally loses out is the consumer. If I were a brand owner I'd be conscious about it but I'd be much more focussed on making my product more relevant for consumers, satisfying their needs." Breakfast Briefing: Google's new ventures, Sainsbury's price matching, Uber and Which?